Third studio album for the Finnish band from Jyväskyla. If there is something that Finland does not lack of, it is young rock bands. It seems that every time you kick one stone in any Finnish city or town, twenty new bands show off. That has its good and bad sides: the circuit is big, the people have great appreciation for rock and metal and there are always musicians to jam with. But on the other hand, if a band wants to break through, it has to show “something” extra than the others. I do not find that extra in Järjestyshäiriö. Certainly they sound compact and professional, but basically like many other dozens of rock bands that sing in Finnish with softer rhythms easier to like also for the female audience. When the band goes a bit more experimental, like in the third track Koneet, the quality boost up. But for most of the album, it just sounds like another average Finnish pop-rock band. If you like bands like Liekki, you can enjoy this one. 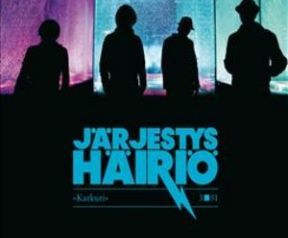 But for an over saturated Finnish market, being a third album, I would say that this is not enough.